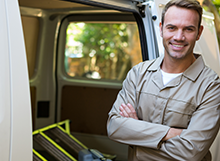 When it comes to garage door service in Bothell, we have learned one important thing: There is never a good timing for a garage door to get stuck and stop working. It can happen early in the morning, just when you are about to take your car out of the garage, and the door just refuse to open, it can happen at night, when you want to use the garage and open the door, and it can happen during opening and closing the garage when the door is in movement. We understand that sometime you need the service ASAP, since you need to access your garage, To help you get your garage fixed ASAP, we offer emergency garage door repairs in Bothell. Whether your overhead door in King County is stuck, if your garage opener in King County do not open the garage, if the spring snapped in Seattle Bothell, or if your commercial garage door in King County is out of the tracks, we can help. We will be there today, and we will fix the problem. To get in touch with Bothell Garage Doors, please call us at (425) 405-6225, email us, or simply fill the contact form bellow. We offer 24-7 repairs, and since we carry parts for garage doors from all brands in Bothell, we will probably complete the service on the spot. There is no need to worry that you may have to wait for few days, or that you will have to change your schedule. We will be there at your convenience, to fix your broken overhead door anywhere in Bothell. We will fix your overhead Garage Door Today!